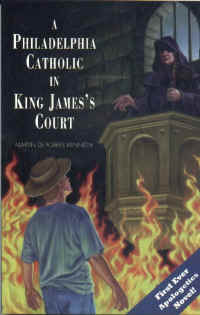 Description: A Philadelphia Catholic in King James Court is a novel about a young Catholic man (age 17) who spends the summer working on his uncle's farm in Kentucky. His uncle is a fundamentalist minister and the story centers on his uncle's efforts to try to convert his nephew away from the "Roman church" which he believes is unbiblical, at best, and at worst, evil. In the uncle's sincere efforts to "save" his nephew's soul we are shown the mindset and techniques which lead so many naive Catholics out of the Church. The young man doesn't know his faith very well, but knows it's true and so begins to study Catholic apologetics to be able to counter his uncle's Bible-alone arguments and defend the Faith. "Not only is it a good read, but it would be a perfect book to use with teens in the dialectical stage. It presents the arguments and reasoning on both sides very effectively and realistically. As a convert to the Catholic Faith, I've read a lot of apologetics books, but this one had defenses I'd never run into before. And because they're in the context of an interesting novel I found myself more able to follow the line of reasoning and to see how to handle challenges to my Faith clearly and with charity. The book also clearly shows that prayer is fundamental to any attempt to sway another person in this area."